Steiff Dumbledore Keyring by Steiff is hand made of cuddly soft plush and wears the famous Stainless steel "Button in Ear" and Yellow ear tag. The former Malfoy family house-elf and one of Harry Potters most loyal friends. 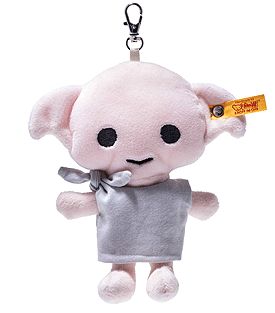 Dobby is a three foot tall house-elf with bat like ears and green eyes the size of tennis balls. Dobby has a type of magic specific to house-elves, performed without a wand which includes the ability to apparate, disarm and make objects levitate.